Was on the way home when our SS called asking if we could catch up tonight - we ended up meeting at 6:30 - I guess site supervisors gotta work around the clock! 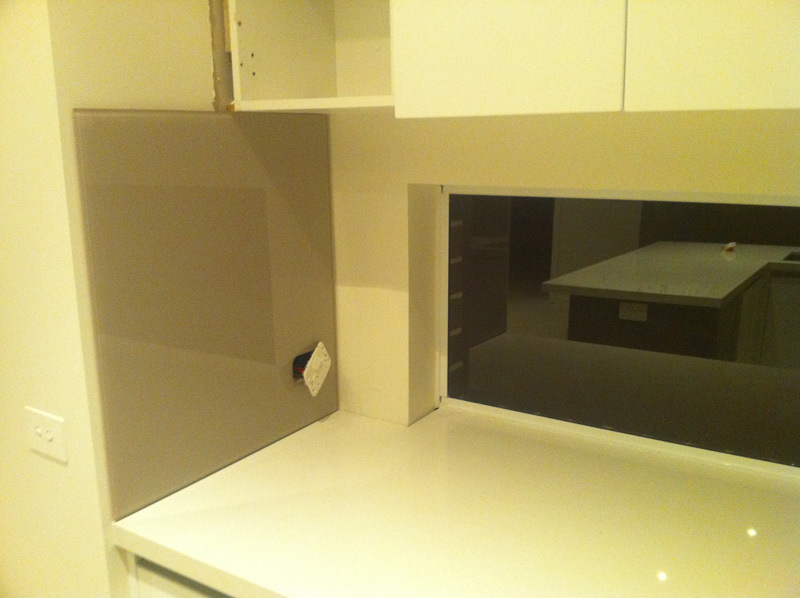 Anyway, it was just to check whether we wanted some extra glass splashback in the kitchen - the standard design doesn't put any glass into the window reveal - despite the fact that all Metricon display homes with a window splashback and glass, have glass that go into the window reveal. So here's a pic - taken on my new iPhone4 (without the useless LED flash going off, which makes everything look blue). The big glass piece on the side with the powerpoint hanging off it is standard, then there's another small glass piece which goes next to it (but only as high as the window reveal), and then there's "normally" plaster at the window reveal. Our SS thought it'd look better with the extra glass piece in both reveals for about $150. Sounds reasonable, and we said so at the time - but now I recall then when we signed up with Metricon there was a promotion on for a glass splashback - we paid extra for the kitchen window, about $800 or so, we didn't get any credit back for the reduction in glass splashback (now taken up by the window) and now we pay a bit more, to get that little bit of glass back.... *sigh* ultimately it's not a huge amount of money, but given that we paid for the window, it would've been nice to have been given the glass that goes into the reveal. Anyway, this certainly isn't a reflection on our SS - we've been quite lucky to have had a couple of very good site supervisors, who seem to be organised, efficient and proactive. Not long to go guys, keep it up! We also had a quick look around the house - shelves are in, wardrobe fitout in the master bed is in (another item thrown in with the promotion, but it's actually quite a good size fitout with lots of shelves and drawers - happy!). Door handles are on, though the master bed door is meant to have a privacy lock which was put on the ensuite toilet instead - an easy fix, just swap the handles around. Errm.... mirror robe doors are on and look good too! Caulker has been through the house sealing up all the gaps. Still waiting on the rainfall showerhead in the ensuite shower and toilets - they'll both be put in sometime soon. The laundry splashback which is a little short will have another row of tiles added... happy about that too. Cement sheeting has been installed in the garage & portico, so they just need to be prepped and painted, then the garage door can go on. The house has also had a bit of a clean, and looks a million times better than when it's filthy! and the upstairs room lights, and where they should be too. The thing about the electrical plan, is that it doesn't specify to the millimeter exactly where things should go. 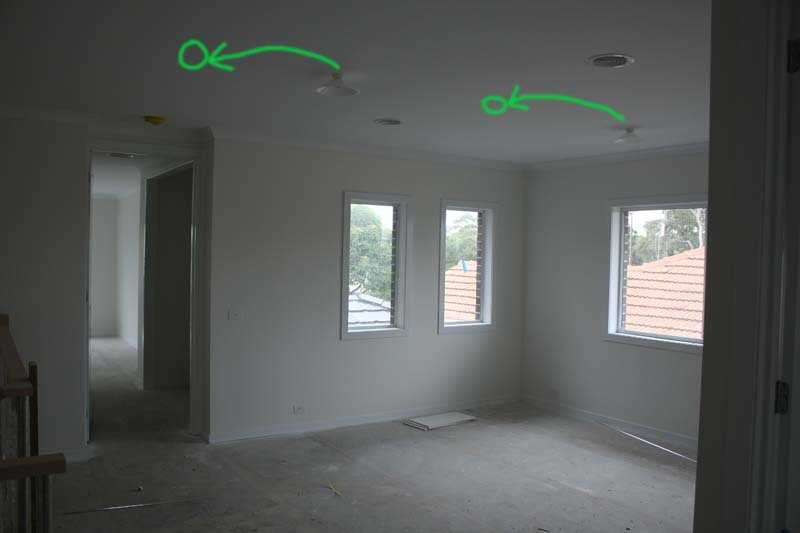 Now that allows for variability in the house construction process - for example, presence of studs or trusses etc, however I don't really think that's an excuse to stick a couple of lights obviously off-centre in the sitting room, or to put them a meter from the expected position upstairs. We did adjust the upstairs light position with our previous SS, and as to be expected not all changes or agreements are communicated to the following SS. Still... all we want are our lights to be centred! Doesn't seem to be too much to ask. The electricians managed to do it everywhere else, but had a bit of a brainfreeze when doing the sitting room and upstairs. And coming back to completion date, we had originally pencilled in Friday 20th August for a completion inspection, but might have to put it back to Tuesday 24th. It's very difficult for me to arrange a day off work, so let's hope this is the last adjustment of date. That said, we're not in a huge rush to get in our house - provided it's of a high quality finish (and YES that includes putting the lights in the centre of the room, not 40cm from a wall!!) we don't mind waiting another week, fortnight or month for the completion inspection. However it seems that head office is pushing for a completion this month, and providing quality doesn't suffer, we'll certainly be happy to have our house done! Also need to organise carpeting - got a quote from Fowles flooring in Clayton for 40.5 lineal meters of carpet - enough for all upstairs and the home theatre room - for a dark grey carpet, so I'll head down there tomorrow to confirm everything and leave a deposit. Not sure if we'll have the carpet done before handover, but it won't be long after anyway, apparently there's a few days to have the carpet in stock, and about 2 weeks to book an installation day. Finally for today, reminder to self: check the final invoice thoroughly! It'll be for the remaining 10% of contract value, plus our electrical upgrades, plus tile upgrades, minus an amount for an underground powerpit which we organised and paid for ourselves, and minus an unknown amount for "cranage provision". Also a credit amount for changing to a different toilet than originally selected, and a little more for that glass splashback extension. Phew, gets complicated! Will also need to have a thorough re-read through the contract and see if there's any other provisional items we may be entitled to. If anyone has had handover on their house, please comment and let us know what to look for, tips and tricks are most welcome! Here are some tips that i used to notice when i was on the worksites. *Fill the bathtub with water and let it sit. (if it has no support a fibreglass bath will tend to make a cracking noise). *Check to see if copper solar panel piping has lagging on it. *Check to see if there are any dint scratches, cracks anywhere in the house. *Natural light also includes turning on light switches if it is too dark. Biggest advice, take you time and go slowly. Make sure ALL of your concerns are noted down and not skipped over. Don't feel that you have to hurry no matter what the SS says. Dont move onto the next room until you are completely satisfied. 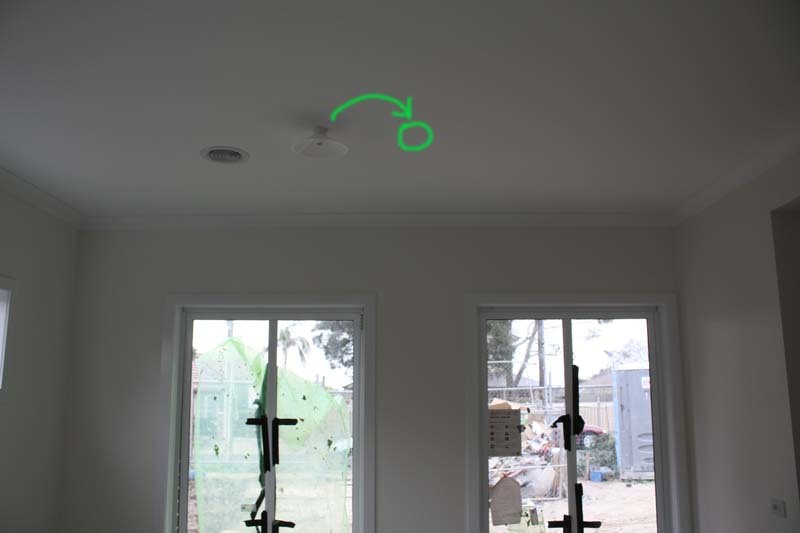 Hi there, 1 major problem with the Nolan is the flashing between the back of the garage and the house. My friend and I both built the Nolan and we both have the same problem. Water was coming into our garage because they didn't pack the flashing properly and it took them 6 month to figure this out and all that time keep telling us because of heavy rain. Don't ever take their answer as a yes, always research and demand for the fix!!! "and minus an unknown amount for "cranage provision". T&T was this a provisional sum? I had many fights for M to remove this as a set amount, which I eventually failed on. There are a number of things they have put in out site costs that just have not been done - neighbour protection, tiger tailing, etc. What are you experiences in getting credits on these? jay: thanks for your detailed hints, very constructive and useful! Will certainly take up much of your advice. struong73: Good to hear of real-life experiences with the Nolan - I'm familiar with the flashing you're talking about, where about half of the guttering at the rear of the garage butts up against the house. Will pay particular attention to make sure there's no leaks, though we'll probably have to wait for some heavy rain to check for that! anonymous: just checked our final contract, it was a provisional sum, so I'm assuming the CSC will have to provide a detailed invoice for the amount used in order to claim against it. Never had to claim on any credits - only now that we're finishing are these things going to be raised, so I'll keep everyone informed on what happens.